In a few days it’s already Valentine’s Day. 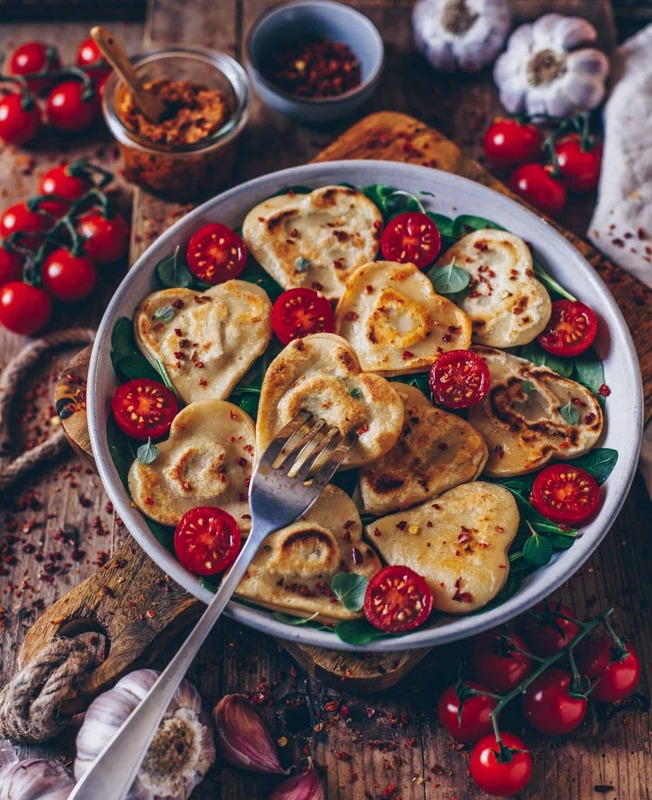 Due to this, I have a delicious recipe for homemade vegan heart ravioli that will definitely conquer all hearts. And not only because they’re so delicious, but also because they’re without any animal products and even look so cute. You know, you eat with your eyes (first). ? Anyways, I’m not a big fan of such “festivities”, as I just don‘t like this consumerism, but what I like otherwise is a themed occasion to be creative again. 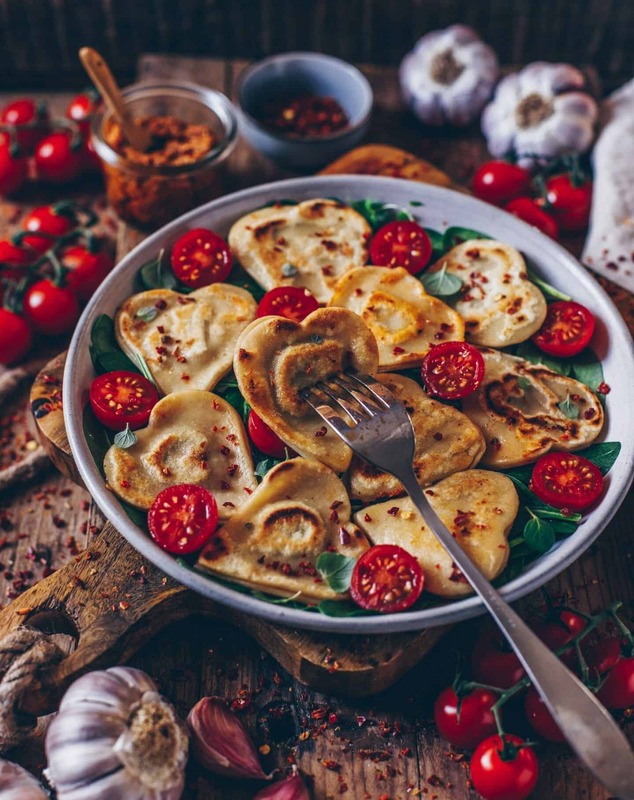 Most of the ravioli or stuffed pasta pockets that you can buy in supermarkets aren‘t vegan as they also contain some undesirable ingredients such as additives and flavor enhancers. So I prefer to make ravioli by myself and that‘s even easier than most people think. 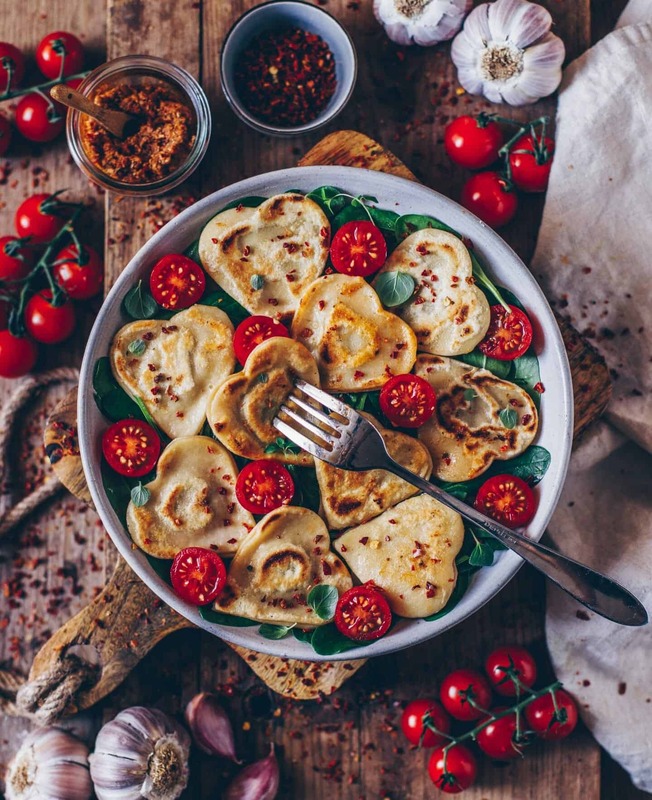 For this recipe you need only a few ingredients, because the pasta dough is just made of flour, water, sea salt and olive oil. These ingredients are simply kneaded and formed into a ball, which then goes into the fridge for one hour. Later you simply roll out the dough and cut or stamp it as you like. For this process, I use different ravioli forms or cutters, which I have at home. Here I linked some -> “kitchenware“. 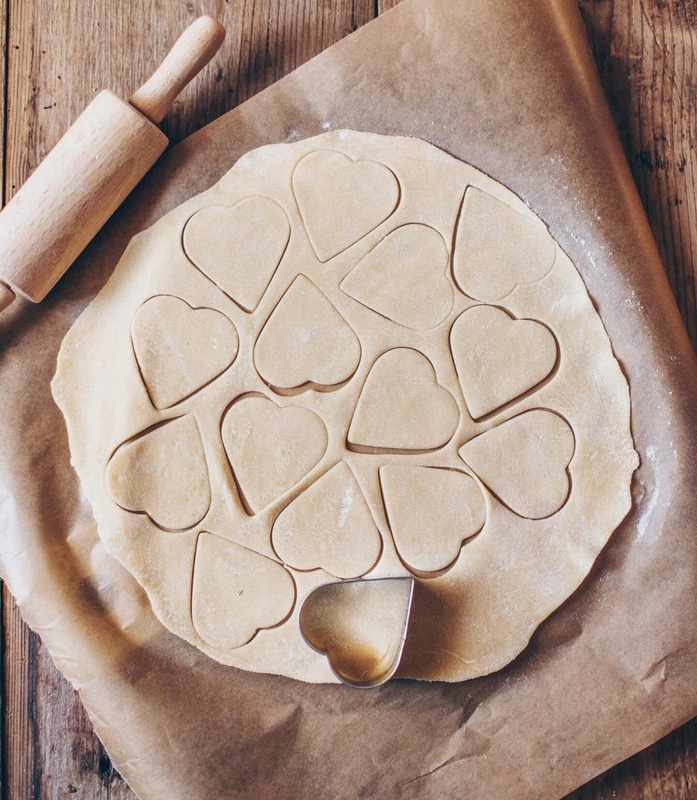 For these heart ravioli, I just used a big heart cookie cutter. You can create the filling from all sorts of vegetables and creams suitable to your mood. Also pestos are great as a filling. If you enter “pesto” in the search function here on my blog, you can also find some yummy recipes. 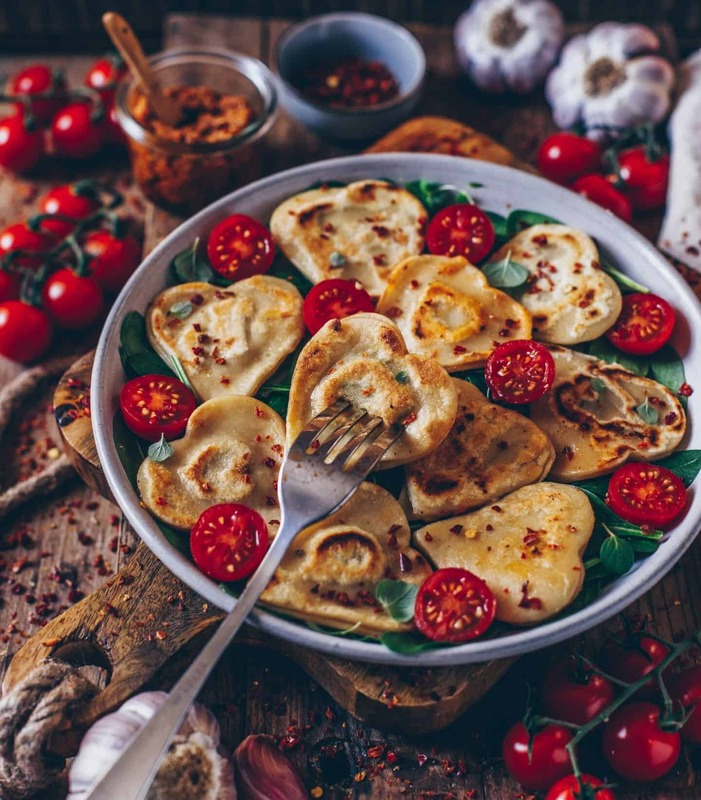 For these ravioli hearts I chose my “Pesto Rosso” recipe. When I start making ravioli, I usually prepare more, because you can easily freeze them to have enough in stock and then just defrost them when you‘ll crave ravioli. If I still have ravioli leftovers from the day before, I usually roast them crispy in olive oil or vegan butter. Another of my favorites is the combination with mushrooms. The instruction for the preparation can be found here: “Crispy Roasted Gnocchi with Garlic Mushrooms and Pine nuts“. First combine flour and salt in a bowl and form a hollow in the middle. Mix water and olive oil in another bowl. Then pour it into the hollow of the flour and stir with a fork. Place the mixture on a floured surface and knead with wet hands to a smooth dough. Then form a ball out of the dough, wrap it in cling film and let it rest in the fridge for about 1 hour. In the meantime, prepare the filling or pesto. Remove the dough from the fridge and roll out thinly with a rolling pin on a floured surface. 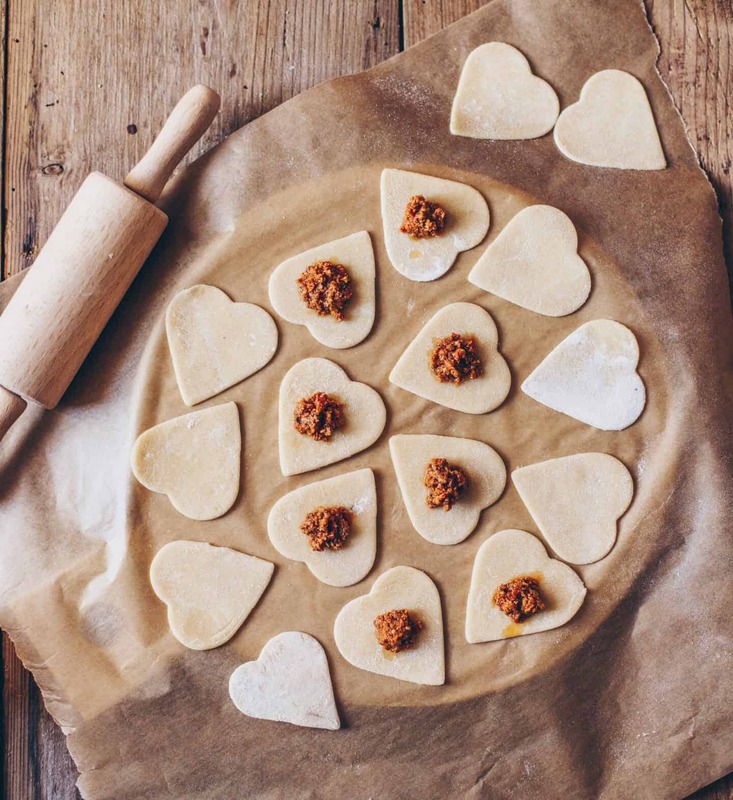 Then spread the filling with a teaspoon as a walnut-sized blob in the middle of half the amount of the noodle hearts . Then moisten the edges of the stuffed pasta hearts with wet fingers. 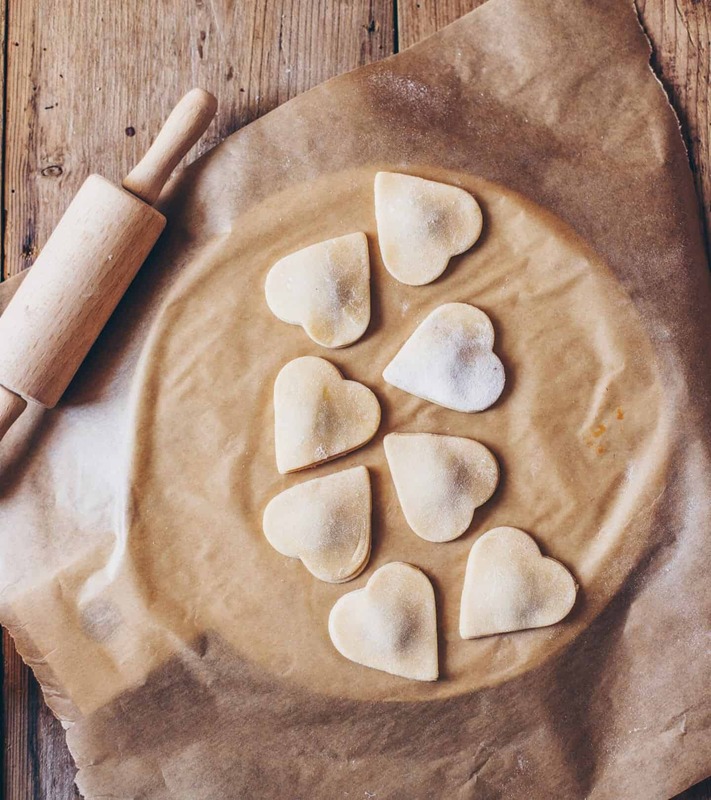 Carefully place the second pasta heart over the filled heart and press the edges. Bring salted water to a boil in a large pot and cook the ravioli for about 6-8 minutes. Then remove the ravioli with a skimmer and drain well. 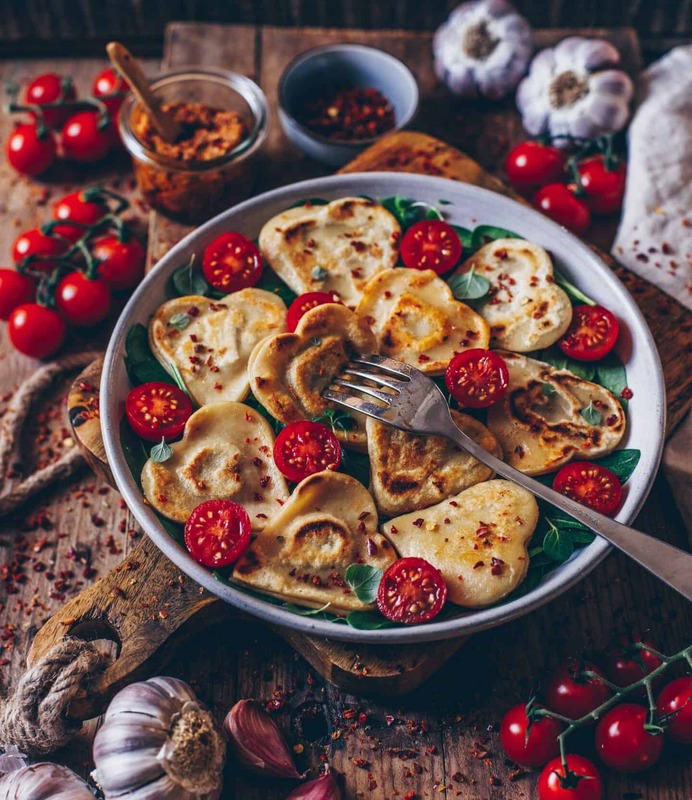 You can serve the ravioli just cooked, for example with a "tomato sauce" or roast them in a pan with some oil or vegan butter until crispy. So glad that you like the recipe ? Thank you so much, Ela! I‘m happy that you like it! ? Thank you so much Nadia! I‘m happy that you like it ?? Made these ravioli with spinach cashew cream filling and it was soo tasty! The recipe for the ravioli dough is just perfect and so easy to work with. The cashew cream recipe is also just as easy and even though I skipped soaking the cashew nuts and just boiled them instead a little for them to soften it turned out to be just great. And btw: I love love love your pictures! Thank you so much for your positive feedback!? I‘m so happy to read that you liked the recipe!